Recently I had a phone conversation with a blogger friend of mine about managing a small business. He quit his job this year to be a freelance writer and work for himself. Since I’ve been in business since 1999, I had loads of advice for him. Then it was my turn to be silent. “Seriously, I get that’s what you want to do. But you need to think about some specific ideas to get you to that place. How do you start your own Business Idea Garden? After my conversation with my blogger friend, I realized that there were other small business owners who may not know how the Business Idea Garden works. It’s probably stuff that you’re already doing but you haven’t put the steps together to create ideas to help your business grow. Let me walk you through the process that I take when I work through my ideas to reach my goals. 1. Where do your ideas come from? This is the first part of the process where most people get stuck. It’s easy to write out goals to say that you want to grow your social site’s fan numbers by 10% but how are you going to make this happen? That’s where your Business Idea Garden comes in. Plan some time to do some brainstorming. I usually block off several hours and make plans to do this out of my office. I find that when I can get away from my desk, I’m able to concentrate better and not get so easily distracted with my binders and work folders on my desk. Now start thinking about everything that you work on during your day. What are the things that you come into contact in your daily world, the things you check off in your list and the stuff you read on a regular basis? During your brainstorm session, think about what would happen if you slowed down and noticed the things around you. Is there a program you could create that would make something easier? Is there a skill you can teach to help other people make their work go smoother, faster or quicker? Do you have some content like a blog post that you can expand on to create a workbook or ebook? After you start writing your ideas down, think about how you can add to that idea. How can your idea be different than the others out there who are already doing this? Don’t worry if you think the expansion of your ideas are too silly or too expensive. Think of it this way – what if money or the time it would take wasn’t an issue? Just write it all out. There are no right or wrong ideas. Just keep writing everything that pops into your head. Then put it down, walk away and come back to your notes at a later planning session. You’ll be surprised at what you see when you review it again. You may see the seeds of an idea come out of those notes that could turn into a realistic option to help you grow your business. For those of us who work by ourselves, we tend to get into this habit of doing everything on our own. And we forget that there are others out there who could help you work through those places where you get stuck. I have an accountability partner who meets with me every month for a Mastermind meeting. She helps me sort through the things in my Business Idea Garden. Sometimes I can write it all out and it feels like nothing is coming together. I have a 15 minute conversation with my accountability partner in our meetings and she’ll pull something out of my notes that I didn’t see. She’ll come up with suggestions that didn’t even cross my mind. Sometimes our Mastermind meetings turn into her sending me links to review or she prints out a worksheet she found that will help me. Think about who you can meet with (or at least Skype, Google Hangout or talk on the phone) where you can bounce ideas off each other. Having these types of conversations can help you get another perspective and give you some options that you haven’t even considered. When you get together for your partner brainstorm session, doing the following will help you pull all these pieces together into an idea that you can create to grow your business. Explain your idea as if this person doesn’t know anything about your business. Clearly define your goals with this idea – your brainstorm partner needs to understand where you want to go with your plans. Walk them through all the steps of your idea, taking out the money or time creation issues when you describe this to them. Listen to their feedback. Don’t argue with their suggestions with “I can’t do that” kind of comments. Just listen and take some notes. After your partner brainstorming session, evaluate your idea and choose the best one to focus on next. If you get stuck as to which one to pursue, put everything away for a few days. And then pick it back up again with a fresh pair of eyes. This has happened to me several times after my Mastermind meeting. My head is swimming with all these great ideas and I don’t know where or what to look at first. That’s when I know I need to walk away. Every time I come back to it, I know which one is my next big idea. And you will too. You’ll know which one it is because it makes sense to where you are with your business. It works with the time and the budget you can commit to it. But what’s more important is that you start to become more aware of how you approach your marketing plans. 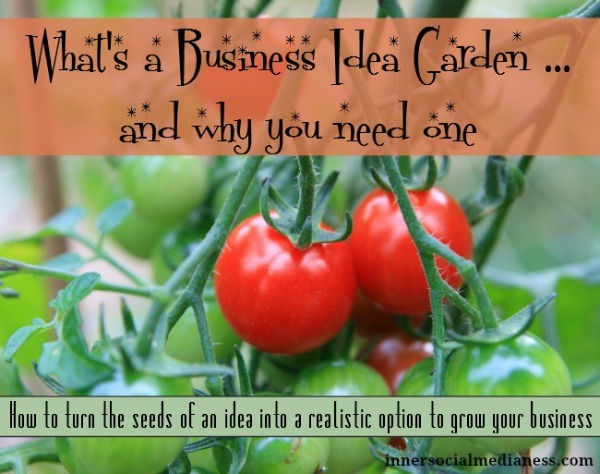 Having a Business Idea Garden is really more than just a problem solving process. It’s a way for you to take control of how you’ll continue to grow your business. Not just growth for growth’s sake, but meaningful growth. PS If you’re looking for time management tips to help you handle your social media marketing , download your FREE copy of my 10 Social Media Time Management Strategies ebook. You’ll learn some cool strategies to help you create a social media routine that works with your crazy busy world.